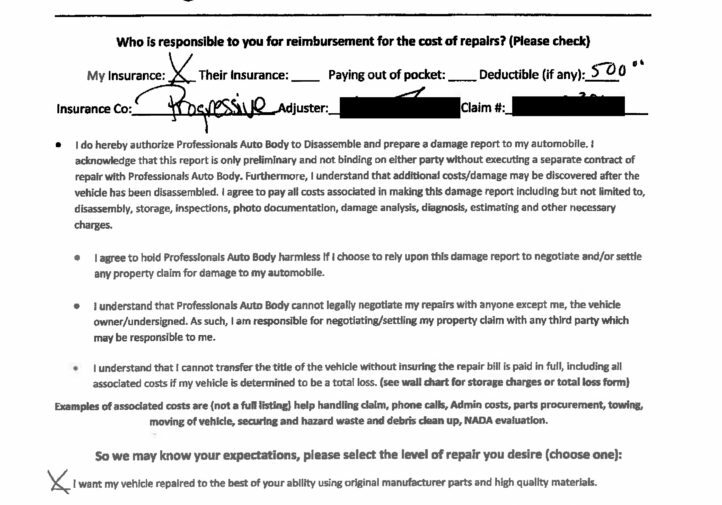 A Pennsylvania collision repairer’s nearly $713,000 litigation tied to Progressive denying parts of scores of first- and third-party customers’ claims has successfully survived part of a motion of dismiss, which might make the case a good legal education for other repairers in Pennsylvania and beyond. 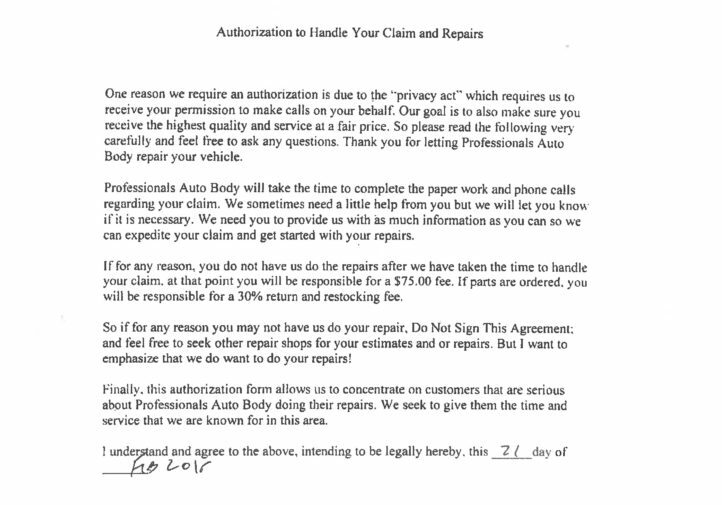 Professionals Auto Body had assignments of benefits approved by claimants, allowing it to collect on their behalf the amounts Progressive refused to pay for “reasonable and necessary” fixes to their vehicles. 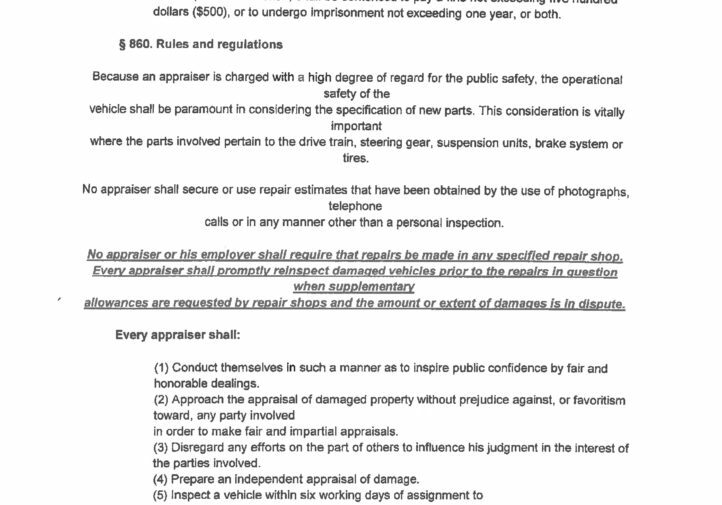 Otherwise, the vehicle owners would have to go out-of-pocket to pay Professionals, Western District of Pennsylvania Senior Judge Kim Gibson wrote in summarizing Professionals argument. Professionals was entitled to pursue breach of contract, bad-faith and unjust enrichment litigation against Progressive for many first-party and third-party claimants, Gibson wrote. (Under Pennsylvania law, third-party claimants can’t pursue bad-faith claims, and the bad-faith statute of limitations expires after two years, leading to Gibson throwing out some of Professionals’ claims.) Unjust enrichment refers to getting a benefit without paying for it; in this case, Professionals argued it granted the benefit of discharging Progressive’s contractual obligation to pay for a proper repair. 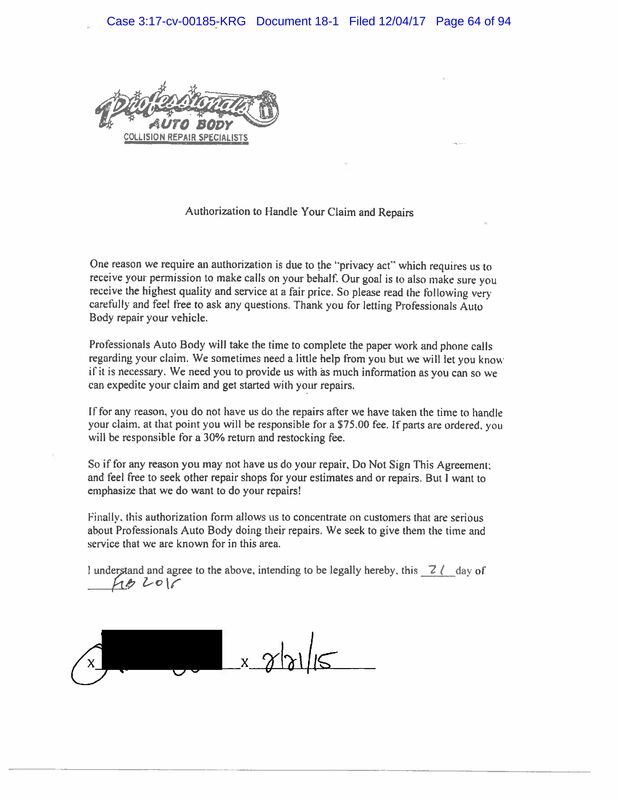 Gibson also threw out Professionals’ attempt to claim tortious interference with its customer contractual relationships. 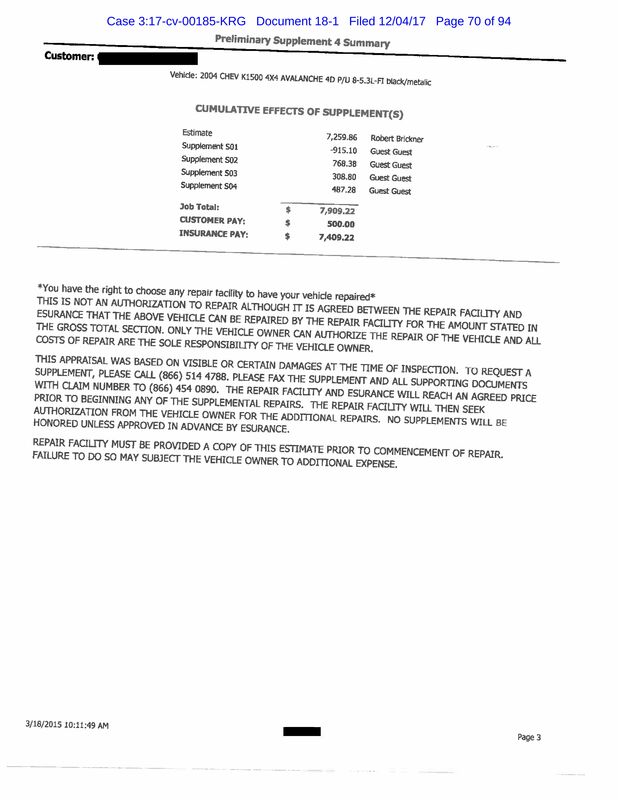 Professionals is seeking $130,575.16 in unpaid repair costs, $550,236.13 in “delay time costs” and $32,161.61 in “administrative costs” and whatever else the court would like to throw its way in regular and punitive damages. 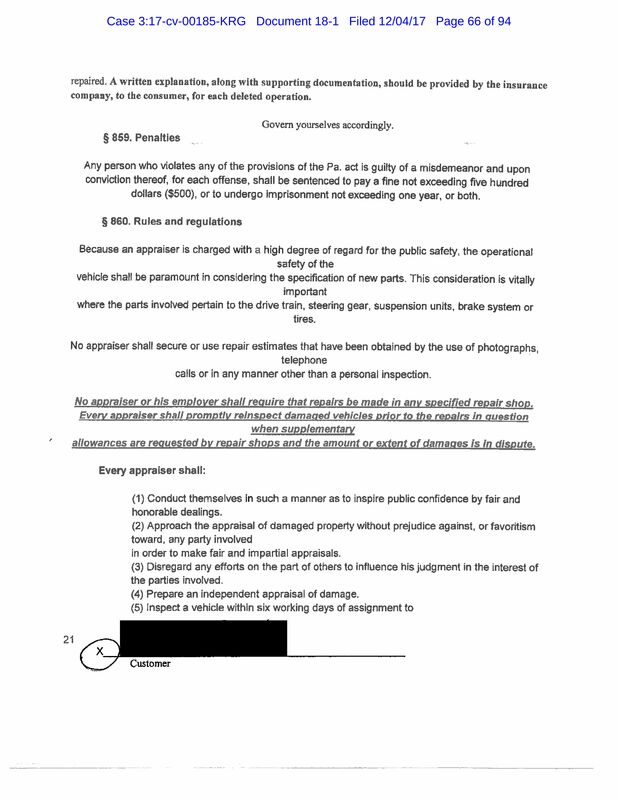 The Professionals’ case clean simplicity — it’s just 16 pages — and extensive but straightforward documentation might make it a user-friendly model for litigation by shops on behalf of themselves and customers in other states. Professionals states that Pennslyvania law grants consumers shop choice, and logically lays out how the process of a customer picking a shop, approving repairs and signing an assignment of proceeds works. 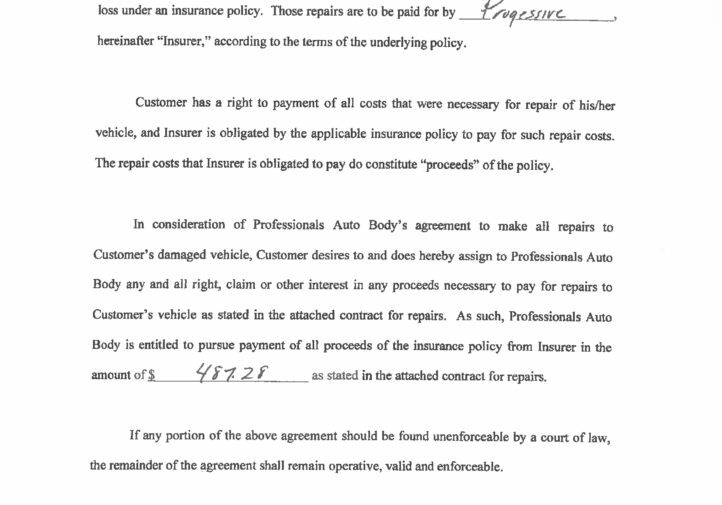 Note that Professionals is approaching this from the perspective of a contractual relationship with the customer, not the insurer, a distinction that can be lost by some shops and which came up when Gibson allowed the unjust enrichment claim to proceed. The customer owes Professionals, and the insurer owes the customer; failure to fully reimburse the customer for whatever it owes Professionals harms the claimant and shop, Professionals argues, acting as both shop and customer. 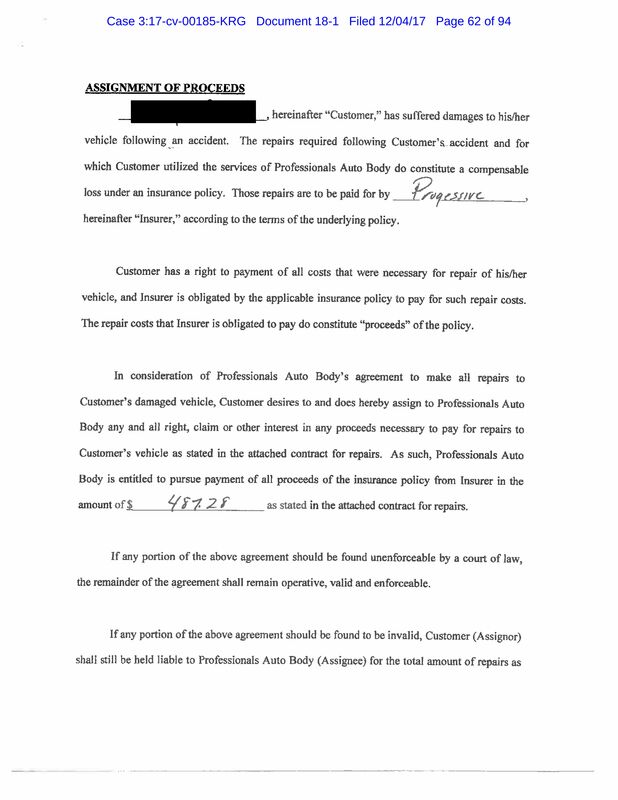 “Individuals identified in Exhibit A either insured by Defendant or having received property damage from an individual insured by Defendant, brought their automobiles to Plaintiff’s auto body repair shop for repairs that were to be covered pursuant to the respective insurance policy whether the policy was by and between the owner of the automobile or a policy with the liable third party,” Professionals’ lawsuit states. 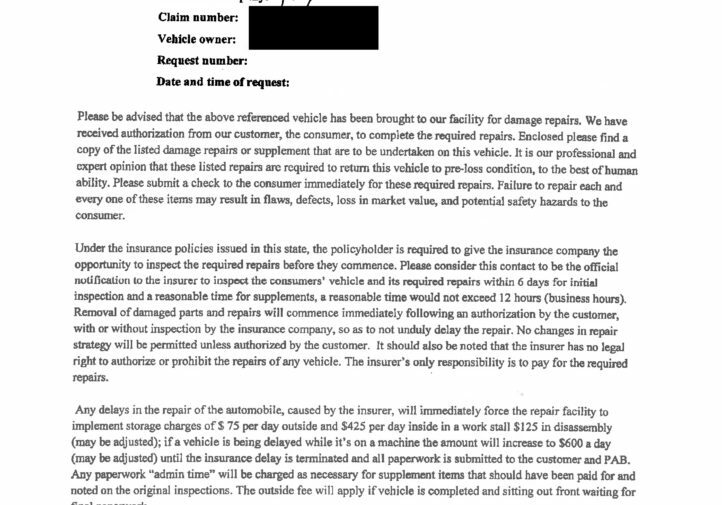 “The automobile owners referenced herein did select Plaintiff to make repairs to their damaged automobiles and provided a written authorization to Plaintiff to perform those repairs reasonable and necessary for the vehicles to be brought back into their pre-loss condition. Rather than bog down the court in discussion of the dozens of customers affected, Professionals gives a single example of a customer allegedly short-paid and refers the judge to its extensive documentation also filed with the court. 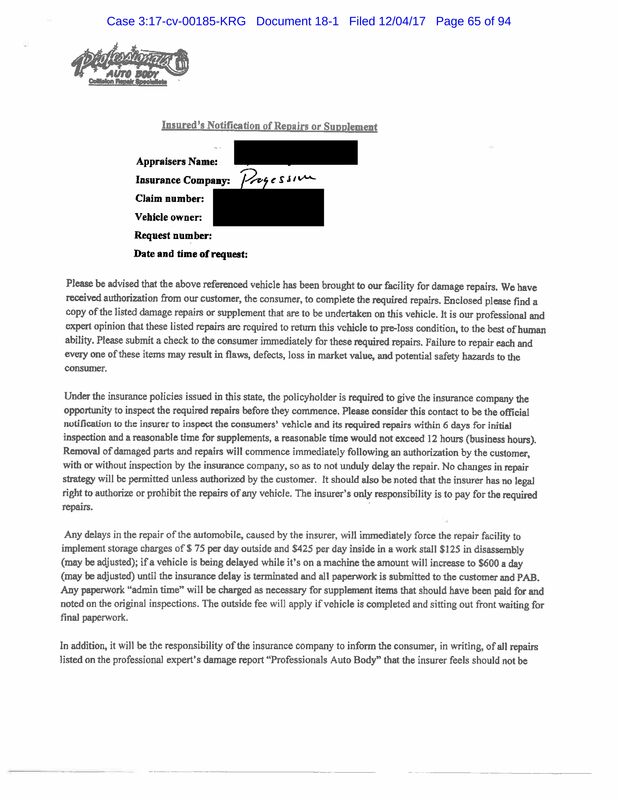 These documents — authorization to handle the claim and repairs, damage report authorization, an assignment of proceeds, and the disputed supplement — seem like fairly straightforward items that a shop would have on file or be able to consult with a qualified legal counsel to develop. 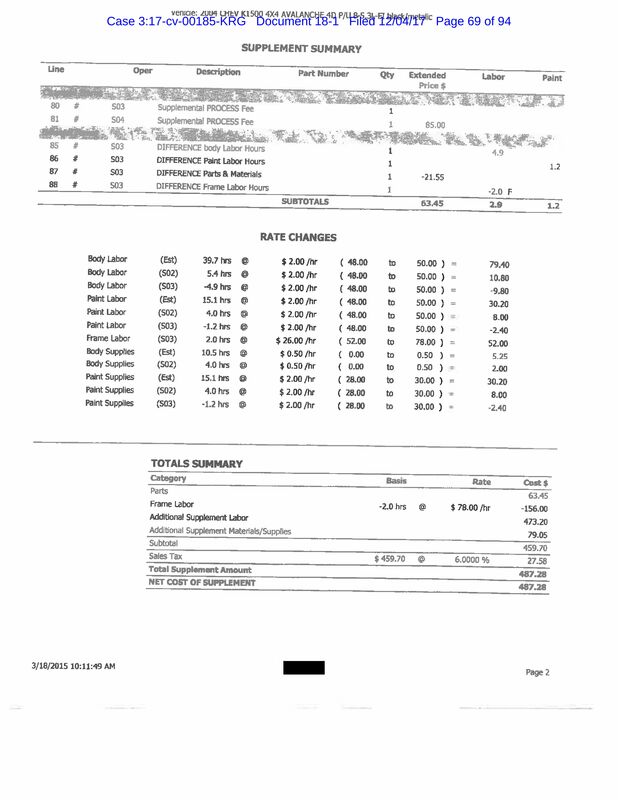 Professionals also used a licensed appraiser to prepare the estimate, an interesting detail. 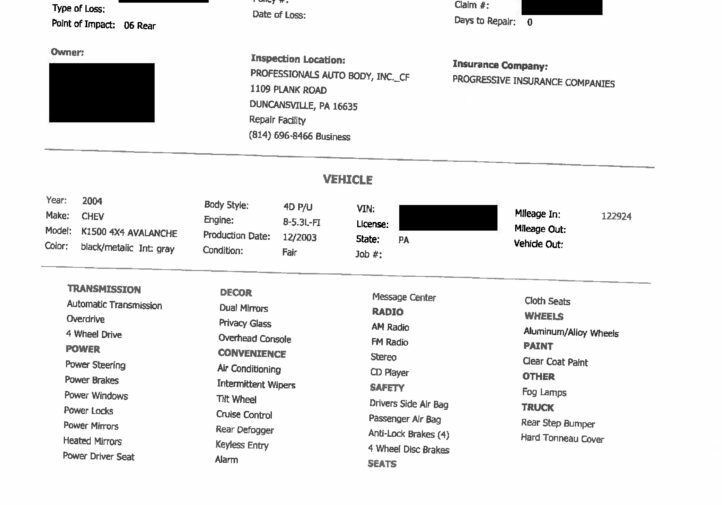 For example but not by way of limitation, automobile owner (REDACTED), brought his 2004 Chevy Avalanche to Plaintiff for repair services in March 2015.
performed rather than to replace the vehicle as a total loss. 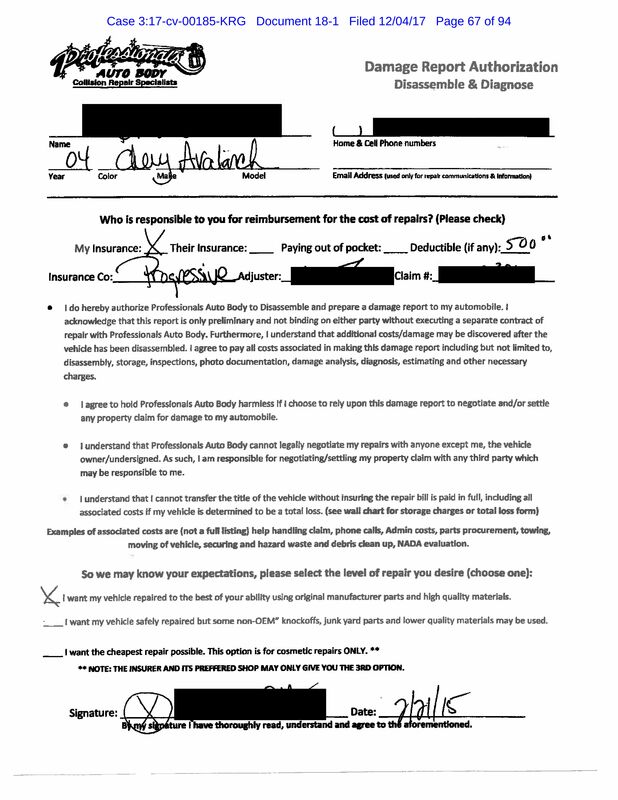 Plaintiff utilized a licensed appraiser at its facility to review all damage, determine necessary repair procedures and prepare a repair estimate, which was then submitted to Defendant. 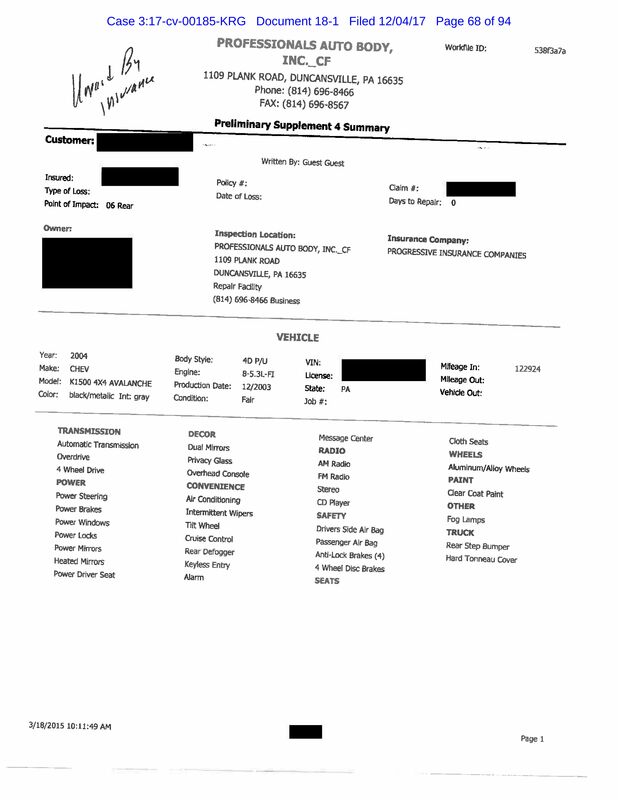 Mr. (REDACTED) executed an Assignment of Proceeds, Authorization to Handle Your Claim and Repairs form, and Damage Report Authorization, copies of which are a part of Exhibit A.
Mr. (REDACTED) elected to have his vehicle repaired to the best of Plaintiff’s ability using original manufactured parts and high quality materials. 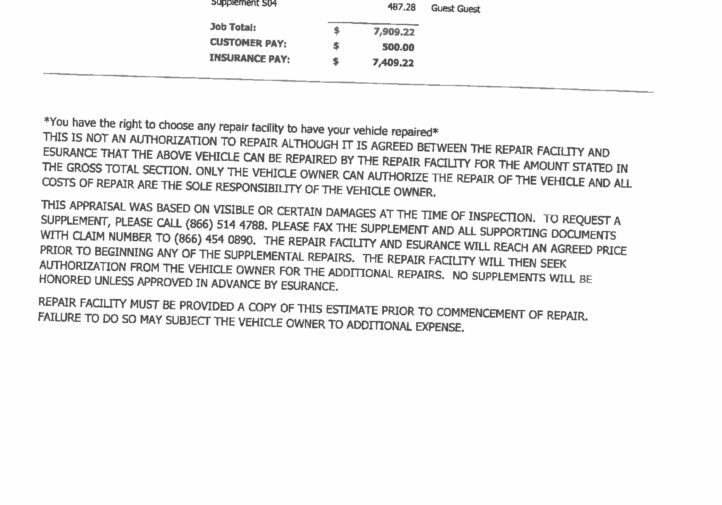 Plaintiff sent notice to Defendant that Mr. (REDACTED) brought his vehicle to Plaintiff’s repair facility and the charges which would accrue for delays on the part of Defendant. 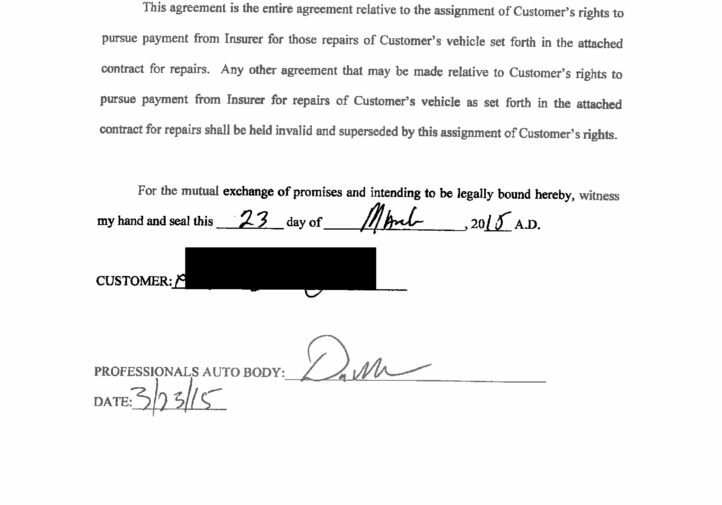 Plaintiff notified Defendant of the original estimate and supplemental charges. 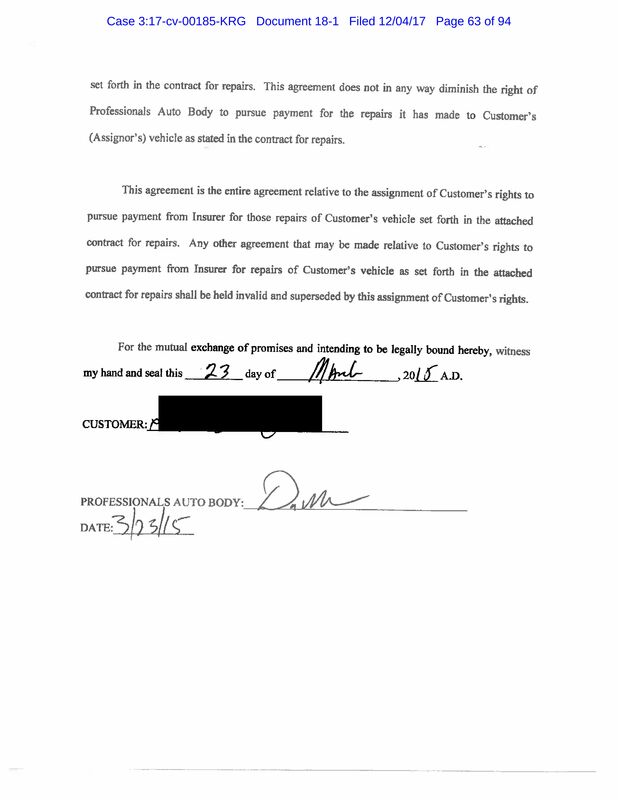 Defendant made partial payment but did not pay Plaintiff in full for the reasonable and necessary repairs. 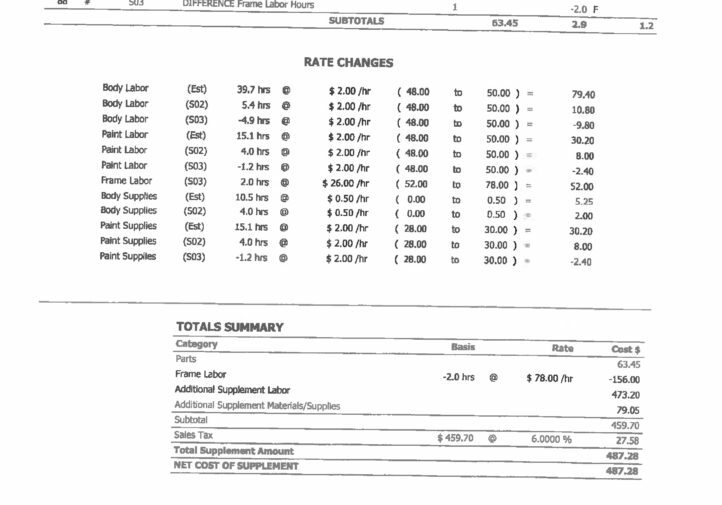 Despite requests for the full reimbursement of the parts and labor invested which were necessary and reasonable to bring Mr. (REDACTED)’s vehicle to its pre-loss condition, Plaintiff remains unpaid in the amount of $847.28 for the parts and labor, together with delay time costs in the amount of $6,965.81, together with Administrative costs in the amount of $434.00. Mr. (REDACTED) is just one example of such practices by Defendant. A complete list of the instances giving rise to this Complaint is attached as Exhibit A. It then went on to list each of its counts against Progressive.